And in a surprising tug of our tear nerves, in the midst of the action-packed finale, we see Bob’s vulnerability: He implores his wife Elastigirl to stay with the kids while he battles a giant robot. She declines angrily, accusing him of shallowness and ego, to which he replies, stuttering, “I’m not strong enough.” She, forcefully, “Strong enough? And this will make you stronger?” He retorts, “I can’t lose you again! Not again. I’m not… strong enough.” … wow… How many kids and mindless adults will miss this subtlety?… Incredible! And when the action comes, it delivers in ways that even some of the more renowned superhero movies do not. And by this I mean, the whole group uses their powers creatively and intelligently, working together to combat their threats efficiently. Truly incredible to behold. 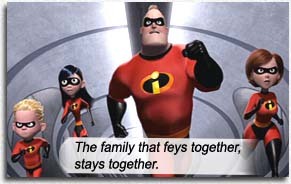 Written and directed by Brad Bird (who does triple duty as Edna Mode, a fashion designer for the hero-conscious), the humor is wit, rather than slapstick, the heroism is moral rather than muscle-bound and the whole outlook is adult rather than kiddie – THE INCREDIBLES is as real a movie as a cartoon gets. Starring: Craig T. Nelson, Holly Hunter, Samuel L. Jackson, Jason Lee, Wallace Shawn, Spencer Fox, Lou Romano, Wayne Canney, Sarah Vowell, Michael Bird, Elizabeth Peña, Bud Luckey, Brad Bird..